Connecting the user-friendly molecular graphics program VMD to the widely adopted MD program NAMD, QwikMD allows its users to setup a molecular simulation in just a few minutes, allowing for quickly study of point mutations, partial deletions or even steering experiments. While making it easy for a new user to perform simulations, QwikMD also works as a learning tool with several "info buttons" where the theoretical background underlying the procedures is provided. The 2.12 release of the molecular dynamics program NAMD provides major enhancements in performance, flexibility, and accuracy, complementing the greatly enhanced usability provided by the QwikMD GUI released in VMD 1.9.3. NVIDIA GPU-accelerated simulations with NAMD 2.12 are up to three times as fast as 2.11, particularly for implicit solvent simulations and single-node simulations of smaller systems. NAMD 2.12 is also optimized for the new Intel Xeon Phi KNL processors found in Argonne Theta, NERSC Cori, and TACC Stampede 2. NAMD 2.12 builds on the asynchronous multi-copy scripting capabilities introduced in NAMD 2.11 with the ability to modify and reload the molecular structure, enabling development of grand canonical and constant pH ensemble methods, as well as an optional Python interface for advanced on-the-fly analysis. Finally, NAMD 2.12 provides a complete, no-recompilation-needed interface for hybrid QM/MM with both the semi-empirical code MOPAC and the ab initio/DFT code ORCA. More on new features in the 2.12 release of NAMD can be found here. NAMD is available free-of-charge as source code, precompiled binaries, pre-installed at supercomputer centers, and now jointly with VMD as one-click interactive molecular modeling on the Amazon cloud. The first version of QwikMD is available in VMD 1.9.3. Attention, this is the first public release of QwikMD. Even though the software was exhaustively tested, QwikMD might still have some bugs so use caution. If you find any problems using QwikMD please contact us by using our BUG REPORT form, or by e-mailing one of QwikMD's main developers: jribeiro@ks.uiuc.edu, rcbernardi@ks.uiuc.edu, or trudack@ks.uiuc.edu. QwikMD is an important part of our training workshops. You can check our upcoming workshops where your can learn more about Computational Biophysics here. For those who are experts in both Molecular Dynamics and Computational Biophysics, using QwikMD should be intuitive. For beginners, QwikMD is a perfect tool that helps overcoming the initial learning barrier imposed by most Molecular Dynamics software. The "info buttons" present in QwikMD help both beginners and experts to take the best advantage of Molecular Dynamics simulations. Each "info button" generates a window where the user can find fundamental information related to Molecular Dynamics simulations, such as the description of solvent models and protein structure, as well as short explanations of the options available in QwikMD graphical interface and the actions triggered by the buttons. For more information, the user is redirected to web-pages through links present in the bottom of the information window. Please check out our one page tutorials, which are useful for a quick start. A complete tutorial is available on our tutorials website. 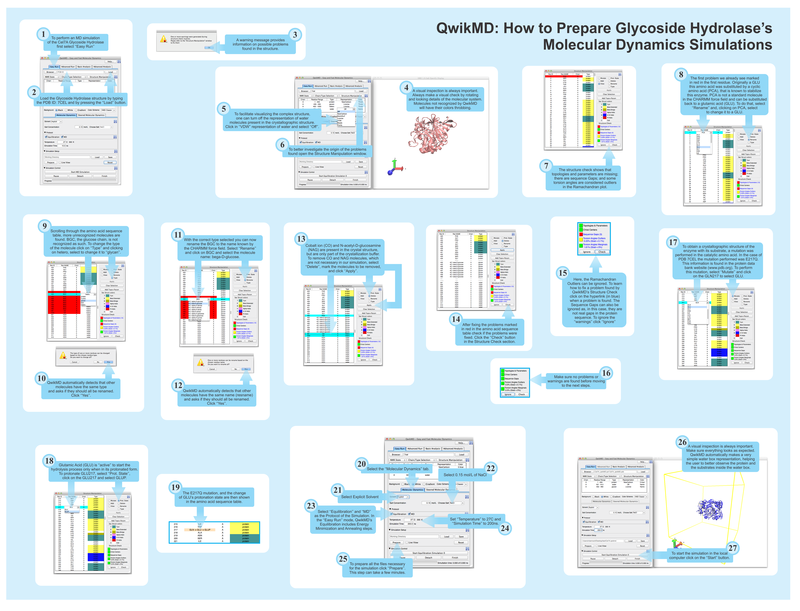 QwikMD - How to perform Glycoside Hydrolases simulations. 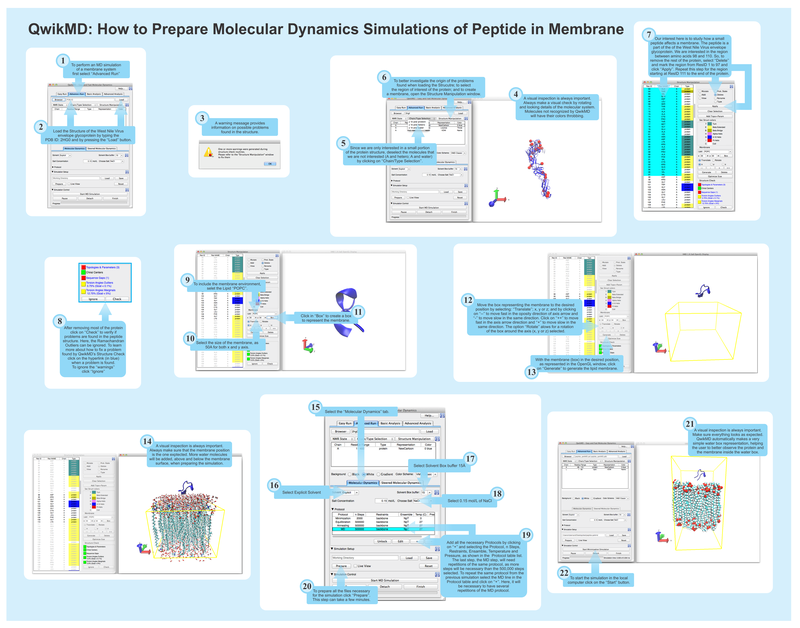 QwikMD - How to perform simulations of Peptide + Membrane. 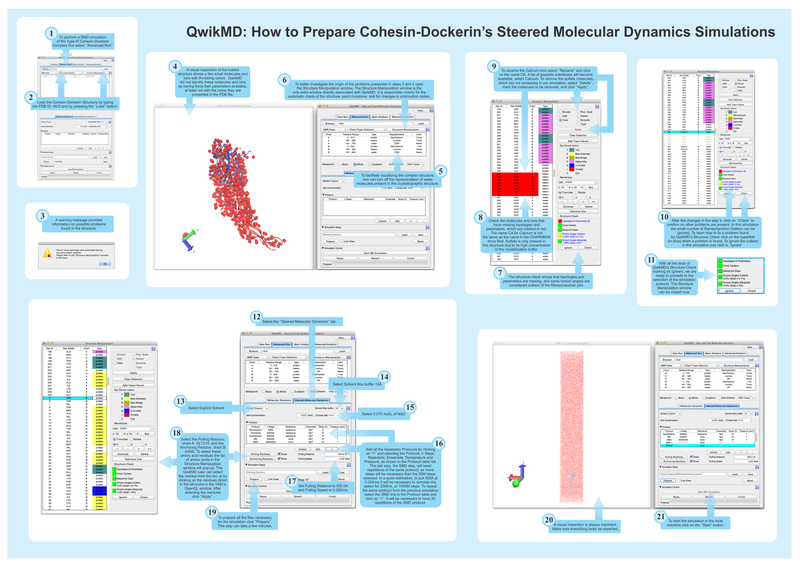 QwikMD - How to perform steered molecular dynamics simulations of ultrastable cellulosome components. QwikMD / MDFF GUI - How to perform MDFF of Adenylate Kinase. Structure of initial conformation of Adenylate Kinase (PDB ID: 1AKE). Density of target conformation of Adenylate Kinase. Structure of target conformation of Adenylate Kinase (PDB ID: 4AKE). Biomolecular force fields fail to address chemical reactions and other complex quantum effects near, e.g., reaction centers. Treating such parts of the molecule via quantum mechanics (QM), while the majority of simulation remains classical, allows the accurate representation of quantum effects in relatively large systems, such as enzymes. While many levels of quantum theory are available, QM/MM simulation requires the exchange of only positions, charges, and forces, enabling a common NAMD interface serving multiple QM engines. In NAMD, a QM/MM interface to both ORCA and MOPAC has already been developed and is available in the nightly build of NAMD. QwikMD fully supports QM/MM simulations in VMD 1.9.4 (alpha) version. Contact Us // Material on this page is copyrighted; contact Webmaster for more information. // Document last modified on 28 Mar 2019 // 35414 accesses since 25 Feb 2016 .